Gastric sleeve surgery which used to be the first stage of biliopancreatic diversion with duodenal switch (BPD-DS) is now one of the commonest bariatric surgeries performed as a stand-alone procedure for the treatment of morbid obesity. It is a restrictive bariatric surgery where the stomach is reduced in capacity by resecting 4/5th of the stomach leaving a sleeve-shaped portion to accommodate the only small amount of food. This leads to early satiety, reduction in calorie intake and weight loss. There is also an additional benefit of improvement/reversal of associated disease conditions such as diabetes, hypertension, osteoarthritis, etc. Most obese individuals have heartburn (a burning central chest pain) as a result of reflux of acidic stomach contents back into the esophagus. There may also be associated feeling of bitter or sour taste in the throat and mouth due to this regurgitation. These symptoms often occur and worse while lying down. This condition is called gastroesophageal reflux disease (GERD). It is one of the obesity-associated disease conditions. Heartburn may improve or get worse after gastric sleeve surgery while some patients without GERD may develop it after gastric sleeve surgery. Gastric sleeve surgery is preferred to other bariatric surgeries because it is relatively safe and there is no significant nutritional deficiency. However, an increased incidence of GERD has been reported. Up to 50% of morbidly obese individuals have GERD.1This has been linked to the relaxation of the lower esophageal sphincter with or without the presence of a hiatal hernia. The increased intra-abdominal pressure that is associated with obesity results in increased gastro-esophageal pressure gradient. It has also been found that the higher the BMI, the higher the risk of GERD. After gastric sleeve surgery, the weight loss leads to a reduction in intra-abdominal pressure. The resection of the fundus of the stomach significantly reduced acid production, and the rate of gastric emptying is accelerated. All these factors prevent reflux of stomach content into the esophagus resulting in a clinical improvement in the symptoms of GERD. Following gastric resection, the large compliant stomach is converted into a less compliant banana-shaped tube. This leads to increased pressure within the stomach. Iatrogenic removal of some fibers in the lower esophageal sphincter and disruption of the anatomical anti-reflux mechanisms result in weakness of the sphincter. All these contribute to reflux of acidic contents back into the esophagus. Stenard and Iannelli reviewed about 13 studies on gastric sleeve surgery and its effect on GERD. The mean BMI was 42kg/m2 while the average follow-up period was 29 months. One of the studies showed a persistent of GERD in up to 84% of the patients. Another study also revealed that symptoms of GERD were more in patients that had gastric sleeve surgery as compared to those that had a Laparoscopic Roux-en-Y gastric bypass. GERD developed in about 2.1-21% of those without pre-operative evidence of GERD. A reduction in the incidence of postoperative GERD symptoms was noticed when hiatal hernia repair was added to the gastric sleeve procedure. The above showed that the effect of the gastric sleeve on pre-existing GERD or its role in the development of GERD varies from one individual to another and from one surgeon to the other. Surgical technique may affect the competency of the lower esophageal sphincter after gastric sleeve surgery. Doctor’s skills and experience are therefore critical in determining the outcome. These researchers also further buttress the claim by some surgeons that gastric sleeve is not for every obese individual especially those with GERD. These set of people can have a Laparoscopic Roux-en-Y gastric bypass rather than a gastric sleeve. Treatment of heartburn following gastric sleeve surgery involves the use of medications that reduce gastric acid secretion such as proton pump inhibitor and the use of antacids. Other maneuvers such as elevation of the head of the bed while sleeping may ameliorate symptoms. Severe cases may need a gastric sleeve revision surgery. In conclusion, obesity is a risk factor for GERD. Many patients will have their symptoms persist after the surgery while some may experience improvement. 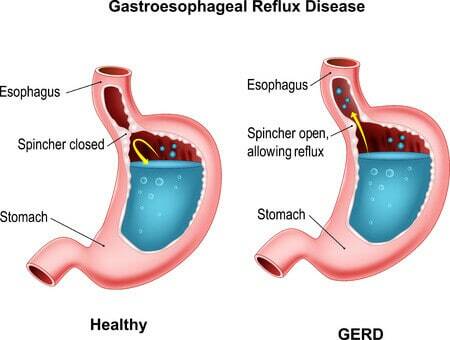 Others without pre-operative symptoms of GERD may develop it after gastric sleeve surgery. Proper screening and patient selection should be carried out to ensure selection of patients with least risk of GERD. Those with high risk should undergo other forms of bariatric surgery. While preparing for gastric sleeve surgery, choose the best surgeon with least record of GERD complication as surgeon’s skills to play a significant role in the effect of gastric sleeve surgery on GERD symptoms. Doulami G, Triantafyllou S, Natoudi M et al. GERD-Related Questionnaires and Obese Population: Can They Really Reflect the Severity of the Disease and the Impact of GERD on Quality of Patients’ Life?. Obesity Surgery. 2015;25(10):1882-1885. doi:10.1007/s11695-015-1614-x. Pandolfino J. The Relationship Between Obesity and GERD: “Big or Overblown.” The American Journal of Gastroenterology. 2008;103(6):1355-1357. doi:10.1111/j.1572-0241.2008.01916.x. Stenard F, Iannelli A. Laparoscopic sleeve gastrectomy and gastroesophageal reflux. World Journal of Gastroenterology : WJG. 2015;21(36):10348-10357. doi:10.3748/wjg.v21.i36.10348.